It’s almost go time – off-season moves made, ink dried on new contracts and pre-season trials done and dusted for another year. In any given season some players face higher expectations than others. Christopher Reive highlights five Kiwis around the NRL who have the heat on them and are worth watching, for better or for worse. We all know what Benji is capable of so there’s always a certain level of suspense when he steps foot on the park. Dragons fans got to see the Marshall effect first-hand last season as the former Kiwi captain led the side into the post-season, ultimately losing their qualifier against the Bulldogs in golden point. Last year, the talk going around was people wondering what Benji was still capable of doing, but this year it’s all about how far he can take this team. While the squad taking the field for the Dragons will look slightly different this year, with the loss of Trent Merrin and the addition of Kurt Mann and Tim Lafai, the core that took them to finals footy last year still stands. The pressure then sits on that group to get them back, and I expect Benji to be a massive part of that charge. If things start to go wrong I wouldn’t be surprised to see him used as a scapegoat – but let’s hope it doesn’t get to that. NRL.com’s stats website lists Lolohea’s position as unknown – and that is both a problem and a blessing for the Warriors. Lolohea is a bit of a head-scratcher from a selection point of view, the young international is too talented to leave out of the 17, but where do you play him with the star power in that backline? While he has been named on the wing in round one, I would expect the backline to be tinkered with in the first few matches to get the best combinations. There is no expectation that Lolohea will be a star in a glistening Warriors side, but there is the expectation that the Warriors will play well, and a lot of that will come down to the consistency in the backline. One or two bad games and your position could be in jeopardy – from a spectator’s standpoint, it’ll be a fun storyline to follow. Kapow is his nickname and probably the best way to summarise his 2015 season. Averaging 27.2 tackles, 10.2 hit-ups and 1.3 offloads per game last year, the Aucklander was a bright spark in an otherwise dismal season for the Tigers. This year he’ll be playing his footy in the crowded Manly forward pack which includes new recruits such as Nate Myles and Lewis Brown. The big question hovering over this group is what the coaching plan will be with the new interchange rules. 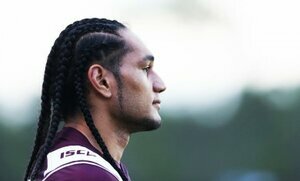 If Taupau can cement himself as an 80-minute lock his performances could even exceed those of last year. Either way I’m looking forward to him having a gun season. In 2016 I think ‘RTS’ is in danger of becoming a victim of his own success. The 2015 season was phenomenal for the young fullback and saw him come out as the best no.1 at the Dally M Awards. A number of people are convinced the performances he showed last year should be what we expect to see in 2016, but there’s one big difference; the Warriors are not the Roosters. With different teams come different structures and game plans, and while the Roosters have been one of the more consistent teams in recent seasons, the Warriors’ flamboyant style of play makes them one of the most unpredictable. The challenge for Tuivasa-Sheck is to keep himself involved. If he gets the touches then there’s no reason he can’t play at a similar level for the Warriors, but will he be averaging 241 running metres again this season. On his day Foran is one of the best playmakers in the competition. Over the past few years he built a dangerous combination with Daly Cherry-Evans, but after signing to play his footy with the Parramatta Eels this year the pressure will be on Foran to be able to create plays as well as he defends them. And as if the marquee signing tag wasn’t enough of to live up to, the Kiwi international has been handed the captain duties. The Blue and Gold have done Foran some favours by signing further attacking options in the likes of former Rooster Michael Jennings, reliable journeyman Michael Gordon and young gun Clinton Gutherson – not to mention a formidable forward pack. The stage has been set for Foran to challenge Johnathan Thurston for the title of top half in the game if the Eels can get some combinations gelling. Christopher Reive is a journalist and life-long rugby league tragic.